Spreadeagled all over a metropolis with very rigid drink driving laws (fortunately), renders it somewhat difficult for the Wine Wankers to get together as often as we would like; particularly when there is wine to taste. Conrad and I therefore arranged a catch up at my place on a Saturday afternoon, as we both had plans that evening. What harm would a couple of bottles of vino cause? Strict instructions were issued by our respective significant others. We commenced our tasting in my garage as it was a warm afternoon and my proximity to the beach makes for quite interesting people watching. Our first bottle was a 1997 Mount Pleasant Lovedale Semillon. This is definitely one of my fave’s and would be on my top 10 white wine list every time. For those not aware of the great Semillon produced in the Hunter Valley it is high time you got your hands on some. As for the vintage, not as good as the ’96 by all accounts, but I have made it my business to taste as many vintages of this superb drop as I can. We surmised that this particular bottle was a little overdeveloped in colour, suggesting that there may have been some cork/bottling/storage issues somewhere in its life. That aside a lovely drop, toasty, lanolin and chalky, the fruit perhaps not lingering as long as it ought. 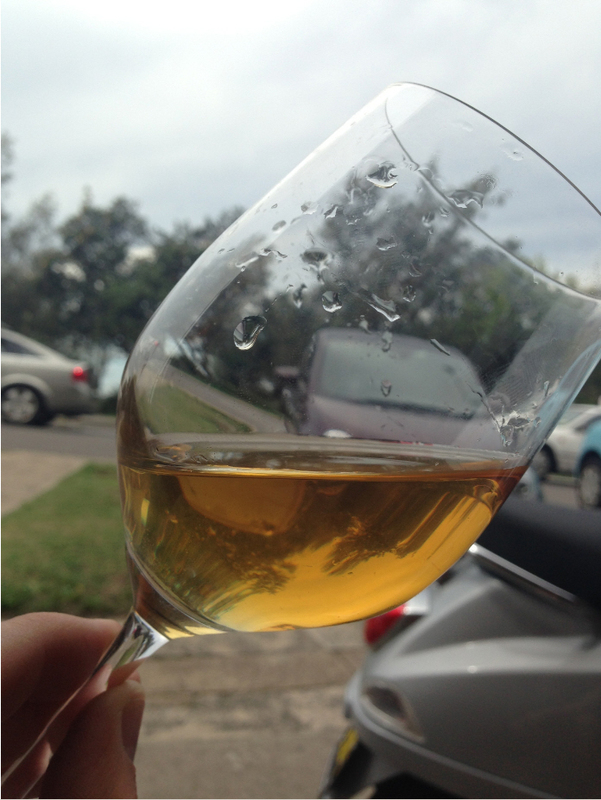 The Lovedale is certainly one of the best examples of Hunter Semillon going around. While partaking of this wine we were accosted by an elderly Italian lady who thought we were hilarious sitting outside with our feet resting on my Vespa drinking vino. “I feel like I am back home in Italy” she said to us with a beaming smile. Moving back inside where it was safer, we were joined by my wife who texted a fellow wine writer Drew (a proper one) stating that we were opening some Rockford wines. Drew arrived in a flash. We threw together an antipasto plate of figs, prosciutto, salami, buffalo mozzarella and crackers to complement the wines. Next up a bottle of current vintage Rockford Black Shiraz, this is a sparkling shiraz (syrah) that is considered one of our finest. The Rockford winery has a quota system in place for their top shelf stuff, and unless you are lucky enough to live in the Barossa Valley, you have to join their mailing list and purchase their lesser wines (which are very good) for several years before you are upgraded to buy the good gear. The only other option is to buy from auction sites where you pay a lot more, and often have no bullet proof guarantee of provenance. I have never been a fan of sparkling shiraz, probably a remnant of some of the dodgey stuff I consumed in my youth, but it’s never too late to grow up. Conrad is a fan (read about it here) so I was keen to open this one with him. This was a lovely drop that is very elegant and balanced, the bubbles actually adding a level of freshness to the wine making it a very drinkable option on a warm afternoon where otherwise you might opt for a white. Lots of black fruits and classic South Austalian shiraz richness. Delicious. 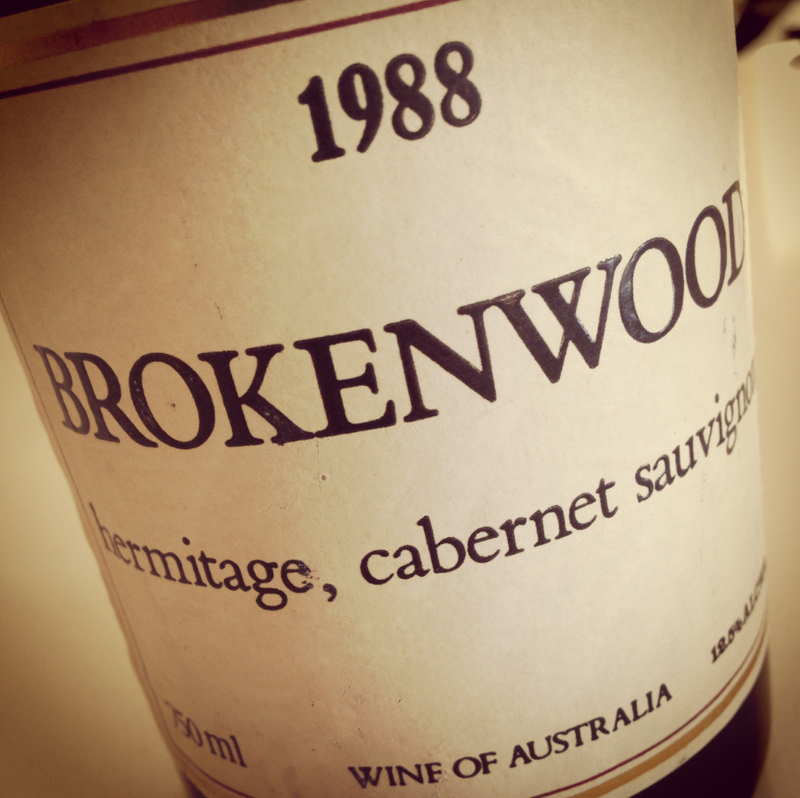 I was very keen to try the next bottle, it was a 1988 Brokenwood Hermitage Cabernet with fruit of unknown origin, we presumed The Hunter Vally and Coonawarra but the label gave nothing away. Now those familiar with our humble blog would know this is one of my favorite wineries and we write about their wine a lot (but get no loving in return … hello Brokenwood). Decanted this for an hour or so to get some air into it. This was still very good with a deep red colour, surprising for the age and the fact that it was presumably not one of their elprimo wines of that time. Lots of savoury flavours like capsicum and broccoli, still with a balanced fruit driven finish. Time to open another Rockford, this time a 2006 Basket Press that I bought at auction (as I am not yet on the good list). This is an Australian icon that is made in a traditional manner by Rocky O’Callaghan at Rockford. A lovely balanced style with soft tannins and delicious length, to my palate not a rich as a lot of classic Barossa shiraz, which is a compliment. More subtle than most. Every Basket Press I have had I can remember with clarity, to me a good sign you are on to something. The final bottle a 2006 Helm Premium Cabernet Sauvignon from the Canberra region. 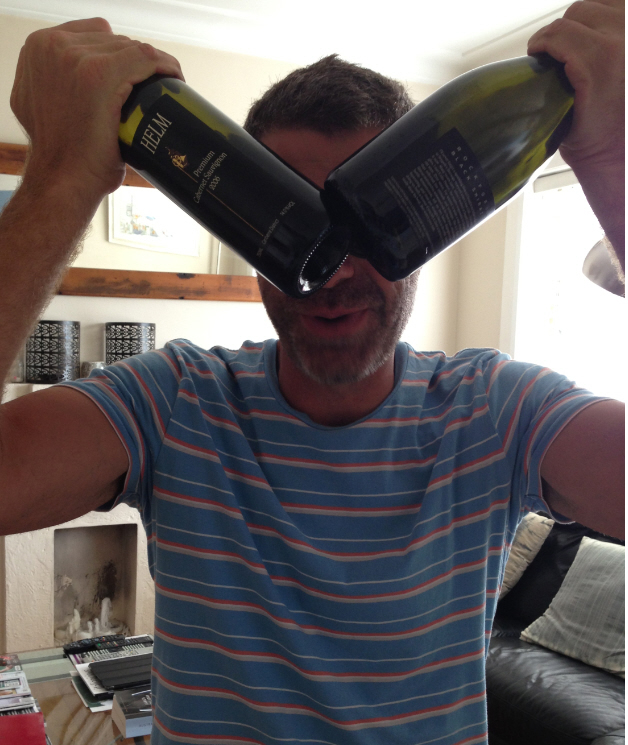 We first tasted Helm wine recently at a wine event and were quite taken by this wine. Aged for 30 months in oak this wine has a lot of time to develop, and that it did. A lovely Cabernet with a lot of the savoury elements dominating, perhaps due to the amount of time in oak. A cracker of an afternoon “on the tiles” in Bondi. For those wondering Out on the Tiles is a Led Zeppelin song and has crept into the Australian vernacular as a night on the town, or in our case, and arvo in Bondi. We all managed to keep our obligations that evening so the outing was a success. Next Half-bottles are a bit of a tease! 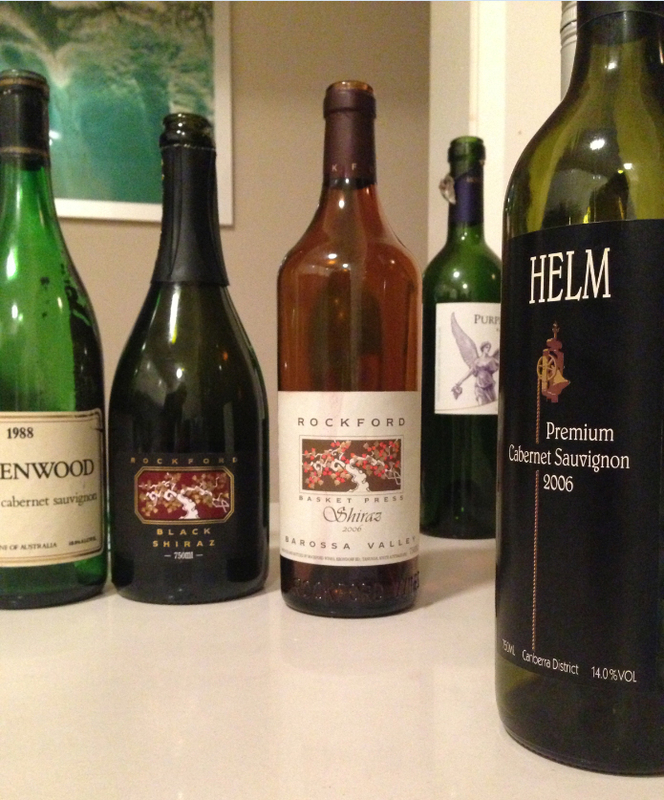 Yes the Helm was a revelation, have other vintages to try now, stay tuned. Gotta love a Semillon Pinot! You live near to the beach, drinking some good stuff, that seems like paradise. Except for the part of your significant other….whooo, hope you didn´t over drink and did something bad, if you did I won´t say anything thoug. And then getting harassed by an Italian women, you guys in Vespa´s…..I´m crossing the ocean right now. Nothing bad. Life is too short not to drink the good stuff. Give it a go, they are lovely when done correctly. I hope you offered la signora a glass. Nice Led Zeppelin III reference too! Yes absolutely. Also a Neil Young one too .. Yes that is an interesting wine that one. Give the sparkling a go, lovely stuff. Thanks for stopping by. Hey, I away enjoy your posts. Was curious have you done any posts on wines from Georgia or Russia. Would love to do a reblog or if you are interested, I’d love to have you write an article for my blog about Russian or Georgian wines. Let me know. No we have not, nor have we tried any. We will see what we can find. Cheers. Thanks, would love to see it. Drew’s bottles look amazingly like my sunglasses! Clearly a good sense of style.